Om Shanti Marsupial Hospital carer Lyn Hancock said nearly a dozen kangaroos and several joeys were trapped in a small bush buffer between The Rivergums housing estate and Safety Bay Road. 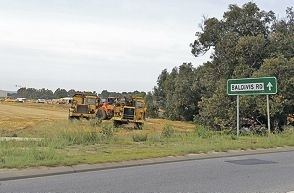 Ms Hancock said bulldozers and trucks completing earthworks for the latest stage of the Cedar Woods development had forced the panicked animals into the road reserve. ‘They are running around frantically because they are frightened of the machinery. ‘Works need to stop or there could be a huge accident if the roos get on the road,’ she said. Cedar Woods State Manager Stuart Duplock said it was a difficult problem but the kangaroos were moving freely through the estate in a one-hectare bush road reserve. ‘This is an unfortunate result of approved urban development but Cedar Woods is committed to producing the best outcomes for the communities we create,’ he said. Mr Duplock said some kangaroos moved out of the road reserve but the developer was considering fencing the area off to protect remaining animals. The Courier received reports that several kangaroos were killed on nearby Baldivis Road in recent weeks. City of Rockingham Mayor Barry Sammels said the City had requested a Fauna Relocation Management Plan condition on the subdivision but the WA Planning Commission did not impose it during the approval process. Cr Sammels said Cedar Woods and Main Roads controlled the land but the City was assisting to ‘minimise’ harm to the animals. ‘There is an escape route along the eastern edge of the work site and we have been working on solutions to channel the animals to safer locations,’ he said. Cr Sammels said the strategy seemed to be working with less kangaroos spotted in the area. Cr Sammels said City rangers were not permitted to act because it was not under the City’s jurisdiction.